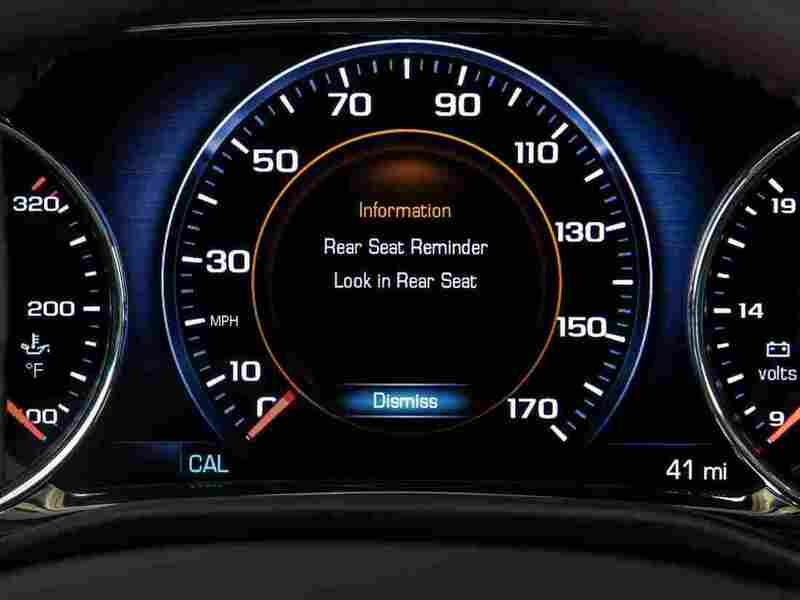 Rear Seat Reminder, designed to remind drivers to check the back seat as they exit their vehicles, will be offered in many Buick, Cadillac, Chevrolet and GMC vehicles by the 2018 model year. Now Congress wants car makers to work in another one: a reminder to check the backseat. The goal is to cut down on the number of kids who die every year in hot cars. On average, 37 kids die each year that way; this year, the toll is 35, and it’s only August. The Hot Cars Act of 2017 — recently introduced in the House and the Senate — doesn’t specify the form that reminder should take. Should it be a beep when you turn off the car? Should your car honk at you? Should your phone ring? Dr. Aditya Belwadi’s job is to study questions like that. He oversees child passenger safety at the Children’s Hospital of Philadelphia, looking at car seats, using crash dummies, computational models — anything related to kids’ safety and cars. The team was trying to get a sense for how reliable these products were in real life: jostled around, battery run down, out of range, covered in bread crumbs and apple juice. How’d it go? Well, the press release about the study was headlined: New Research Says Current Warning Systems Designed to Detect Children Left in Vehicles Are Not Reliable. Now, the landscape of technology to address this problem has changed. Carmakers and car seat makers are getting involved. General Motors released the Rear Seat Reminder system in the spring of 2016 in the GMC Acadia. The reminder “is activated when you use a rear door 10 minutes before or any time when the vehicle is on,” says Tricia Morrow, a global safety engineer at GM. “Subsequently when you turn your vehicle off, the driver will hear five distinct chimes — they’re different than any other chimes that you would hear in your vehicle.” And a message displays in the dashboard. Morrow says the feature is now standard on over 20 models across GMC, Chevrolet, Buick and Cadillac. This summer, Nissan came out with its own version, called Rear Door Alert. It will honk at a driver who opened the rear door before driving somewhere and then leaves the car without opening the rear door again. Another promising technology is a chest clip sensor, introduced by car seat maker Evenflo in 2015, which notifies drivers if the harness is still clipped on a baby after the car is turned off. Waze, the popular smartphone traffic app, also has an option that will remind you to look in the back seat when you reach your destination. Belwadi thinks using the rear door as the trigger is the right approach, since it addresses kids both in and out of car seats. And he’s excited about the Hot Cars Act of 2017 and the role that it could play to push manufacturers to address the issue. But even if the bill becomes law, new cars are required to have a reminder system, and it starts getting rolled out in every new car, it’s still going to be a very long time before this technology is truly widespread. “If you bring a new technology in today it’s going to take a good decade before every single car is going to have that,” Belwadi says. GM’s Morrow says the automaker has only done market research so far, so it’s not known how well these new technologies work in the wild. They’ve yet to undergo the battery of tests and scenarios the earlier tools went through in the 2011 survey. 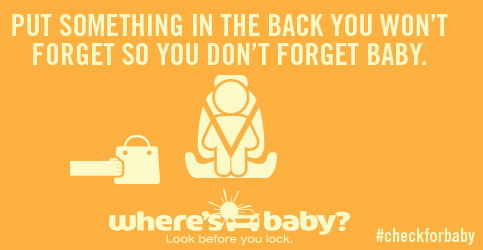 A government safety message urges parents to put something in their car’s back seat so they won’t forget a baby is there. And even if research leads to solutions that are reliable, effective and easy to roll out, Belwadi warns that people still can’t let their guard down.